Most of the time, when someone is selling or sharing photos of an antique photo brooch, it’s described as mourning jewelry. This find is proof that not all of these pieces were mourning objects. 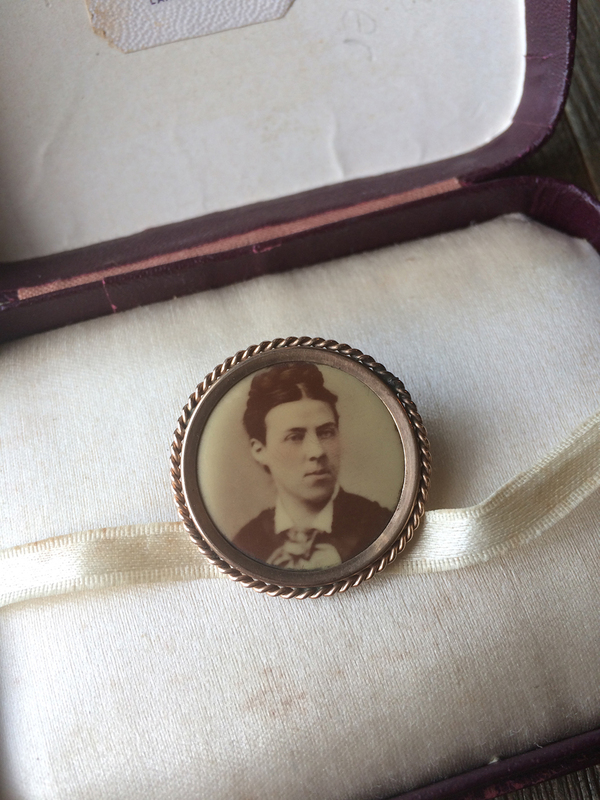 The sitter for the photograph encased in this Victorian pin was Lora (nee Peirce) Cooper. Writing on the inside of the box dates the photo to 1875 when Lora was 26 years old. 1875 is also the year she was married to Morris Cooper. The good news is that Lora was alive and well long after this photo was taken and after this beautiful piece of jewelry was created. She died, aged 77, in Lancaster, Pennsylvania, where she lived her entire life. A couple of interesting family tidbits: Her parents were Quakers, also known as The Religious Society of Friends. Lora’s maternal grandfather, Asa Walton, also a Quaker, was a founding member of the Clarkson Anti-Slavery Society, and he, along with his wife, Mary Taylor, were conductors of the Underground Railroad. In 1838, the couple aided runaway slave, James Williams, who fled from Maryland. According to a family member on ancestry who had contact with the current owner of the Walton farm, a small hidden room behind a wall in the barn was discovered during remodeling. The room was well disguised and only accessible via a small trap door. I’m not sure why you can’t see the images. I’ve checked on multiple devices and they are loading for me. I’ll ask a couple friends to view the post and see if they can see them. Thank you for letting me know!